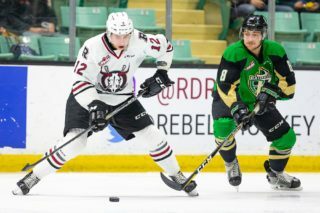 Despite appearing in 52 games with the Red Deer Rebels last season, Hunter Donohoe is just now showing the attributes that have made him an effective Western Hockey League defenceman. In this, his second season, the Surrey, B.C., native has looked far more calm and composed as part of a solid Rebels defensive corps. The fact that he’s impressively mobile for a six-foot-five blueliner hasn’t hurt. The 18-year-old said Wednesday that he’s still adapting on the fly and tries to play within his limits. “For me, I think at the start it was about learning, and I still am, but I think I’ve come into my game a little more. I kind of know how to play to my strengths a little more,” he said. 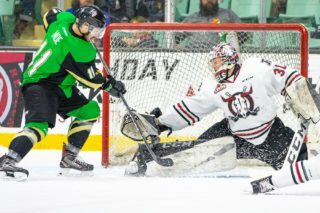 Listed by the Rebels two years ago while he was playing major midget in his home province, the now 205-pound rearguard admitted that it’s taken some time for him to believe that he’s a legitimate major junior player. 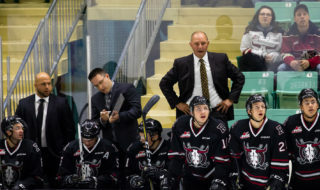 Rebels GM/head coach Brent Sutter has been happy with the manner in which Donohoe has progressed this season, but also stressed that the second-year blueliner has to get away from the habit of being his own worst critic. “The biggest thing with him is he’s his own worst enemy because he’s so hard on himself all the time,” said Sutter. “He has to grow out of that because it hurts his confidence when he gets like that. We’ve been working on it with him, to get him to understand that when he makes a mistake it doesn’t have to be the end of the world. Because of the Rebels’ experienced depth and the presence of two younger and emerging players — Chase Leslie and Ryan Gottfried — on their back end, Donohoe isn’t guaranteed to be in the lineup every night, although he has taken a regular shift in 13 games this fall. “My biggest thing with him is just a consistency thing game to game and he’s getting better at that,” said Sutter. “Right now, between him and Gotts and Les, none of them are going to play ahead of our top five. So you have three guys fighting to be the sixth and seventh defencemen. A guy like Hunter might sit because we want to play the other guys. “It’s not going to make him happy, but reality is reality. We have a 16-year-old kid (Leslie) who’s banged up a bit right now but we’ll get him back, and we have a 17-year-old defenceman (Gottfried) who’s going to be a real solid player for us, and they have to get ice time. The Rebels open a three-games-in-three nights- road trip Friday versus the Brandon Wheat Kings as the top team in the Central Division, the owners of an impressive 11-4-1-0 record. Donohoe suggested that a strong work ethic and the ability to stick to a game plan have been the club’s keys to success this season. 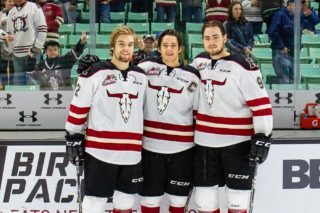 Team success can’t happen without individual success and Donohoe’s contributions could potentially gain him the interest of one or more NHL scouts. Clearly, added pressure isn’t something that Donohoe needs, Sutter noted, considering he still has to work on his mental game. “Instead of parking it and moving on, if something happens during a game it affects him the next few shifts,” said Sutter. The Rebels continue their excursion Saturday in Moose Jaw and conclude the trip with a Sunday afternoon engagement with the Swift Current Broncos. 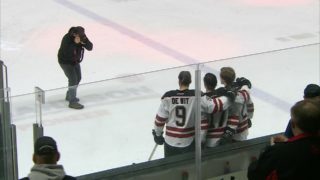 Red Deer’s next home game is Friday, Nov. 16 versus the Kelowna Rockets.